Development on the "C" model had commenced in 1960, with production starting in June 1966. A total of 766 "C" models was completed, including five for the Royal Australian Navy and five for Norway. The balance went to the US Army. Many UH-1Cs were later re-engined with the 1,400 shp (1,000 kW) Lycoming T53-L-13 powerplant. With this engine they were redesignated UH-1M. A great number of these craft ended up in various Army National guard units. Those who read the early preview and build article on the Hobby Boss P-47D should have a pretty good idea of what this kit is like. In league with the earlier release, the kit does not have a lot of parts. 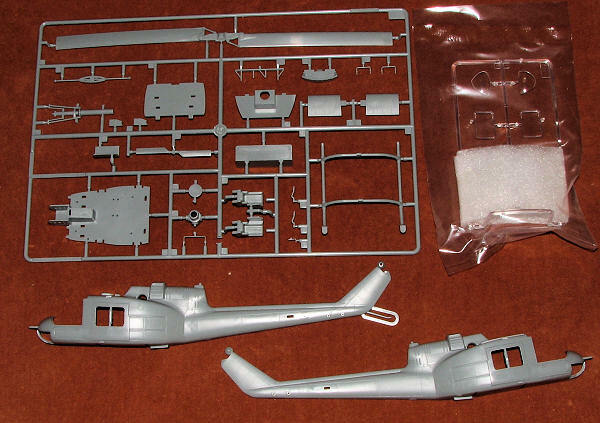 In this case a clear sprue, a main sprue and two fuselage halves. The forward section of the fuselage halves and the main canopy piece are protected with foam wrap. There are no optional bits and no armament is included. These helos also operated as standard 'slicks' so that is not really much of a concern. Typical of many older helo kits, there is no collective so you will need to manufacture one if you wish to have that on your kit. There are also no rudder pedals. Two armored seats are provided, both with no harness detail. The instrument panel has raised details and there is a decal for this. There is also raised detail on the center console. No upper console is provided. For the cabin, jump seats are provided with five along the back wall and a rear facing seat that could probably hold two. The aft seats have belt detail. The one piece blade assembly attaches to the mast and a balancer assembly is put atop that. Nothing fancy and expected in this scale. All of the various antennas save a 'towel rack' antenna on the roof and two similar ones on the aft	 boom are molded in place. Instructions are two construction steps that are well drawn and provide some color info. It shows the bit you see through the lower forward windows as being silver with a black anti-glare panel. No other interior color is provided save for the inside of the fuselage walls being 'Aircraft Grey'. Seems to me that the interior of these aircraft should be dark gull grey with the aft wall padding being a similar color. Seat fabrics are probably a dark drab color of some sort. Those who have more color info on these aircraft can provide more information in that regard. 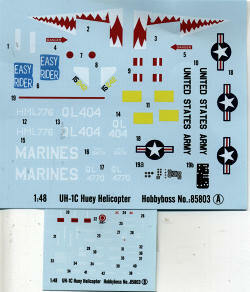 Decals are provided for two aircraft in overall olive drab with red horizontal stabilizers for the shark mouth aircraft of the 174 AHC gun platoon in 1970. 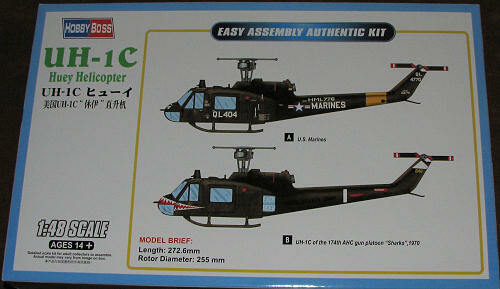 The USMC version with HML-776 has a yellow tail band. Both have black rotor blades with yellow tips and a red/white/red tail rotor tip. Both also have a black upper nose section. The decals are very nicely printed and the full color exterior painting and markings placement guide provide color information from four manufacturers. I know I enjoyed building the earlier P-47 in this series and I am sure this one will be just as much fun. You have to overlook the total fidelity to detail these kits offer as that is not their purpose. However, they fit very well and are perfect for those who want a nice model without fiddly bits, or for the younger modeler who has graduated from snap kits. Thanks to Squadron Products for the preview kit. Get yours today at your local retailer.